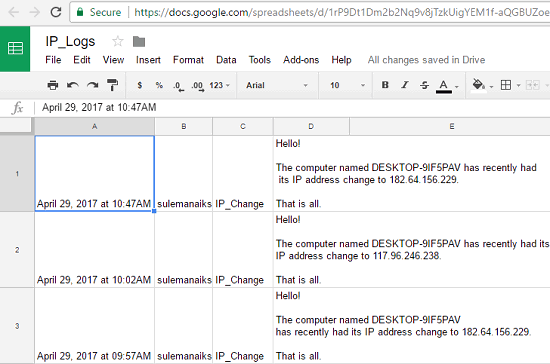 This tutorial explains how to log IP address changes in Google Sheets. Whenever external IP address of PC changes, a new row will be added to Google Sheets. I have listed a very easy tweak that you can perform on your PC to make log of IP changes in Google Sheets. In the following tutorial, I will use a freeware, TrueIP that can do this in an easy way. Additionally, to save the log in Google Sheets I will use IFTTT to make the log in Google Sheets of IP changes. There is a feature in TrueIP that it can send you emails whenever the external IP of your PC changes. I will use this feature to send an email via specific subject. And then using IFTTT, I will create a trigger, based on the subject of incoming email. And when the email with the specified subject is encountered, then the email body will be synced to the Google Sheets for which you have created the trigger. At this point, you should have understood what it takes to log IP address changes in Google Sheets. So, let’s see the whole process of doing that in more details. 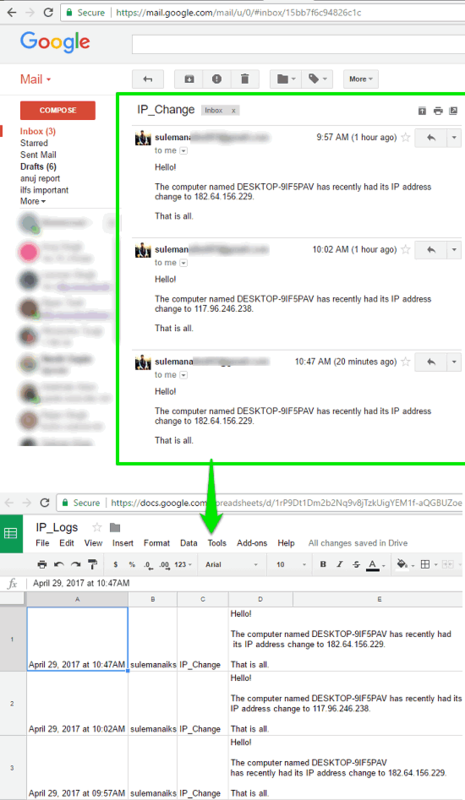 How to Log IP Address Changes in Google Sheets? 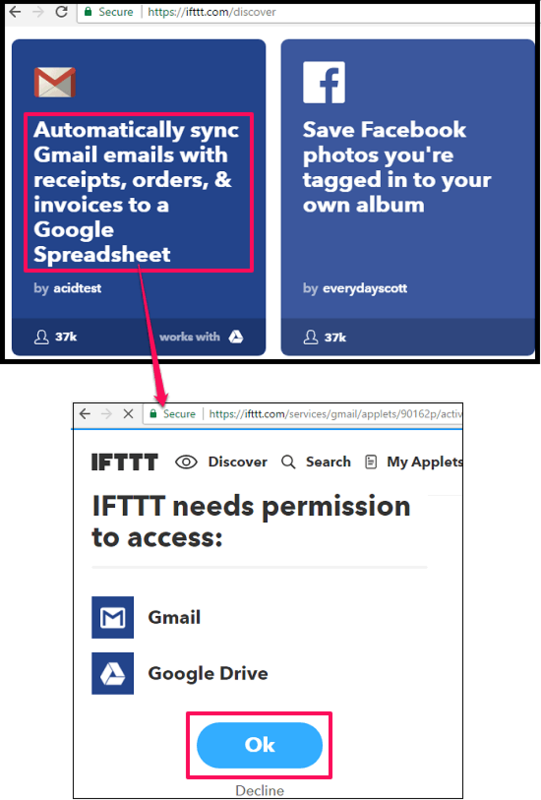 IFTTT stands for “IF This Then That”, it is an online service that has various applets in it which get invoked by detecting changes in other web services like Facebook, Gmail, Pinterest, etc. And one of the applet in IFTTT is syncing emails with Google Sheets. You can can create an applet in IFTTT and use your Gmail account to sync mails that have a specific subject. Step 1: Download TrueIP from this link and install it on your computer. After installing you will be able to see its tray icon. Right click on the tray icon and open Options window of TrueIP. See the below screenshot. Step 2: Now, from the options window, check the E-mail me option and click on Email Setting button. 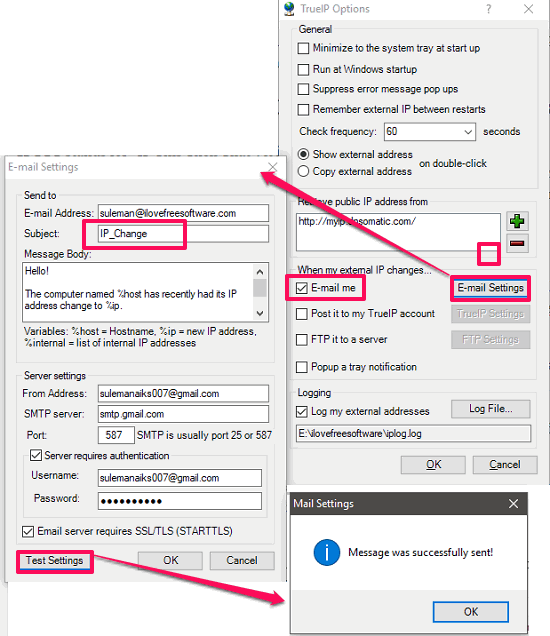 Now setup the email settings by specifying various parameters such as sender’s email address, receiver’s email address, SMTP settings, SMTP port, and subject. While specifying the subject, make sure to pick a specific subject, and you will have to add this subject in IFTTT. After specifying all these, hit the Test Settings button and after success, hit the OK button. Step 3: Open IFTTT website from this link. If you don’t have an account, then create one and proceed. 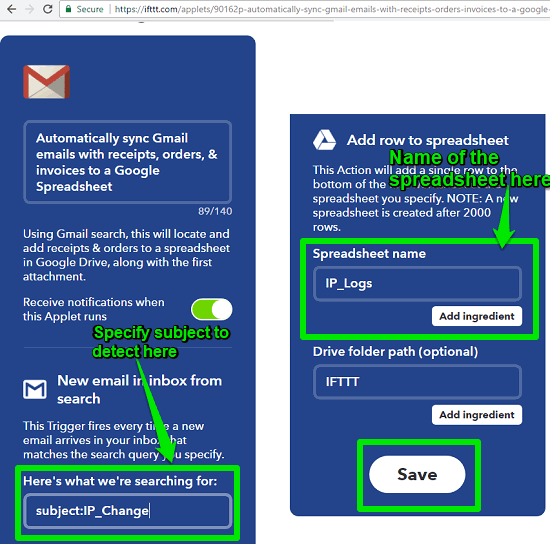 Now find the “Automatically Sync Gmail Emails To a Google Spreadsheet” applet, and select it. After that, it will ask for the permission to access your Gmail and Google Drive. Simply, allow it and proceed. Step 4: Now, a page will appear, where you have to configure the applet. Specify the subject for the incoming mails that you want to monitor. Next, specify the spreadsheet name and path (optional). After all set, click on the Save button and you are done. From now on whenever TrueIP will detect any changes in the external IP of your PC, it will send you an email notification with the same subject that you have specified during step 2. And when this email arrives in your Gmail inbox, then IFTTT applet will get triggered, and as a result, it will sync the email to the Google Sheet that you have specified. So, in this way you can easily log IP changes in Google Sheets. IFTTT and TrueIP freeware makes it pretty easy to do that. In the tutorial above I have explained how to log IP address changes to Google Sheets. And to do that, I have used TrueIP freeware and IFTTT. I really like the role of IFTTT as it (almost) immediately syncs the email notification to the Google Sheet. So, if you are looking for ways to log IP address changes in Google sheets, then this tutorial will be useful.